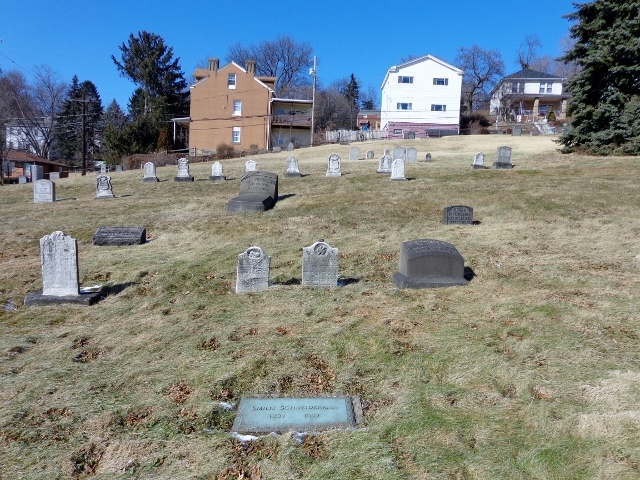 One of the questions I had when I started researching my Schoenthal relatives and their lives in western Pennsylvania was what kind of Jewish community existed in that region during the second half of the 19th century. Learning more about my great-great-uncle Henry Schoenthal made me even more curious about that community. I now have found two resources that help answer that question. According to my records, Jacob Goldsmith is listed as living in Washington, PA, even before 1853. The 1850 US census has him listed as living there and working as a tailor. He was still there for the 1860 census and also registered for the Civil War draft in Washington in 1863. His father Simon, widow of Fanny Schoenthal, was also living in Washington by 1860. And Jacob Goldsmith was still there when his cousin Henry Schoenthal arrived there in 1866, according to Henry’s diary and the Beers biography of Henry, which says that Henry clerked in Jacob’s store for three years after he arrived in Washington. By 1890, things began to change in Little Washington. In that year the very small Jewish community established a synagogue, Beth Israel, a congregation which exists to this day. I was very fortunate to connect with Marilyn A. Posner, a past president of Beth Israel as well as the author of the centennial history of the synagogue, The House of Israel, A Home in Washington: 100 Years of Beth Israel Congregation, 1891-1991 / 5652-5752 (1991, Congregation Beth Israel, Washington, Pennsylvania). As Posner’s book describes, in 1890 the congregation hired a young rabbi named Jacob Goldfarb as its first spiritual leader. Rabbi Goldfarb was a recent immigrant from Lithuania. As described by Posner, “He was fluent in the Lithuanian, Russian, German, Hebrew and Yiddish languages. He was a mohel, able to perform ritual circumcisions; a shochet, or ritual butcher; a chazzan or cantor; and he studied Talmud and Torah.” (Posner, p. 1.) If that’s not killing multiple birds with one stone, I don’t know what is! 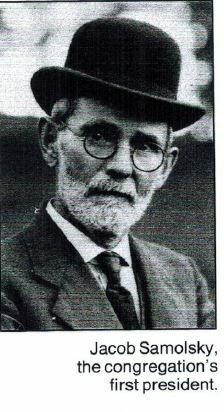 Beth Israel’s services were at first held in the home of one of its members, Nathan Samuels. Then the congregation met in rented facilities for some years. Beth Israel, unlike some nearby synagogues, was not Hungarian or Galician. When its charter was taken out in 1901, twenty-four of its twenty-seven subscribers were Lithuanian …. The few Germans in Washington, Henry Schoenthal among them, were absent from the charter. With the synagogue officially chartered, ground was broken for building a permanent home for the congregation and a cornerstone was laid on June 29, 1902. By that time the Washington Jewish community had become one of the leading Jewish communities in western Pennsylvania outside of Pittsburgh. 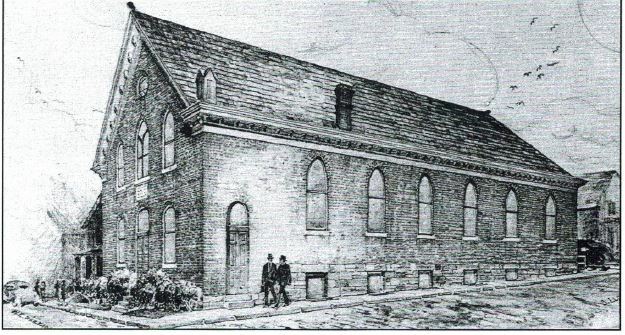 Sketch of the original Beth Israel synagogue building. With this history in mind, I better understand why my relatives settled in western Pennsylvania and specifically in Washington and why they felt comfortable living there. 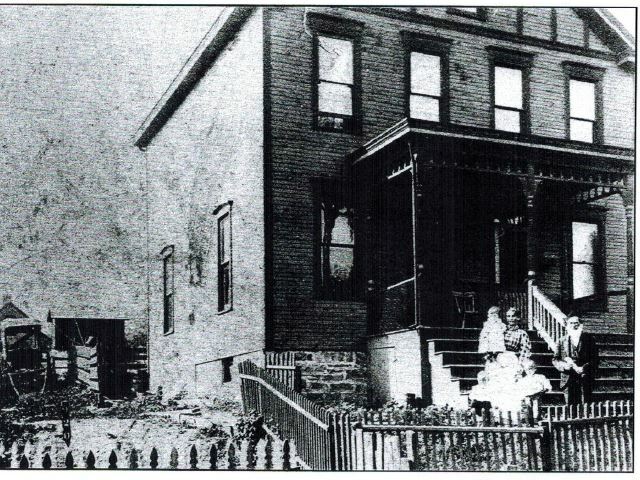 Many of the Schoenthal descendants continued to live there for many years, and there are still quite a few living in Pittsburgh to this day. My research indicates that Nathan was no longer living in western Pennsylvania, let alone Washington, in 1890, but that he had moved to Washington, DC, ten years before and was living in either Richmond, VA, or Philadelphia by 1890. This entry was posted in Germany, Pennsylvania, Pittsburgh, Schoenthal, Washington PA and tagged Allegheny County, Jews, Pennsylvania, Pittsburgh, Washington, Western Pennsylvania by Amy. Bookmark the permalink. I really enjoy reading about the twists and turns of your research. Thanks so much, Janet! It is a lot of fun and so rewarding. Interesting. I recently moved to Pittsburgh thinking I had no family connections to the area, only to discover that my great-grandfather, who was Jewish, lived here for many years when he first came to America. Thanks for sharing your research. Ha, his name was Abraham Schenker and he arrived in Pittsburgh around the turn of the century. I haven’t seen that name—yet! Absolutely fabulous research, Amy. I love this! Of course, when I started reading I had to keep repressing images of Gene Wilder in The Frisco Kid from my mind . . . .
That’s too funny! Thanks, Luanne. Amy, Pittsburgh’s 7th Mayor, Samuel Pettigrew, was Jewish! His father, a Christian, came to America from Scotland & fought in the Battle of Bunker Hill (Revolutionary War). At a party for George Washington he met & fell in love with a Jewish woman from Easton, PA. I work in the Mayor’s office & have been researching all of our Mayors’ families for our 200th anniversary. Hi Gloria! Thank you for reading and for getting in touch. That’s a fascinating bit of history. When was Pettigrew the mayor? And when is the 200th anniversary celebration? Our 200th Anniversary of incorporation as a City is in 2016. I have found descendants/relatives of almost all of our 56 Mayors & they will be attending our parade & celebration on July 9, 2016. I will be in touch. My next post later this week will be about my Pittsburgh relatives. Is there any reference to the TUTEUR family in Pittsburgh and surrounding Allegheny County? One branch of the Tuteurs emigrated to Pennsylvania (both Philly and Pittsburgh) from the Palatinate (Pfalz) in Germany in the middle of the 19th C. I’m curious whether they appear in the book, and whether they intersect at all with your family? Hi, Michael. I checked the book’s index, and the name Tuteur does not appear, nor have I seen it in my research. Are you doing genealogy research? If so and you need some help, just let me know. Thanks for such a quick reply! I have been researching the TUTEUR family (among others) since 1990. 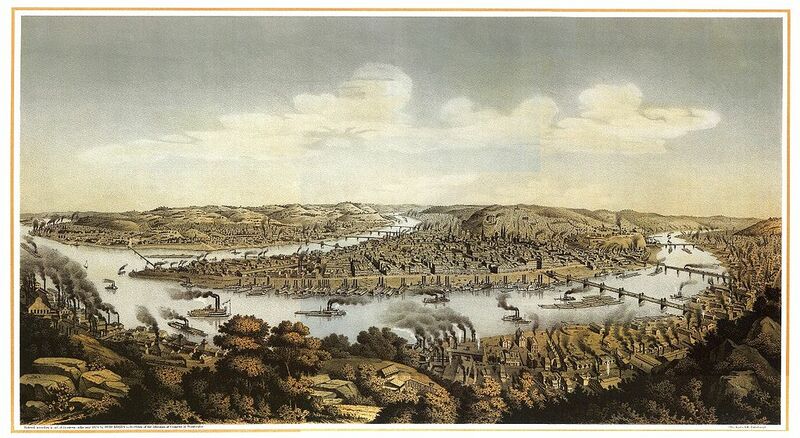 I know from the censuses and city directories that certain members of the family emigrated to Pittsburgh around 1850 and that some were still there into the 19th C. More members of this branch of the family (including the elderly mother/grandmother, Elisabetha (also Liebet) Rosenzweig Tuteur) settled in Philly, where some are reportedly buried in the Rodef Shalom cemetery. I’m trying to trace what happened to all the many descendants over the following century and a half. 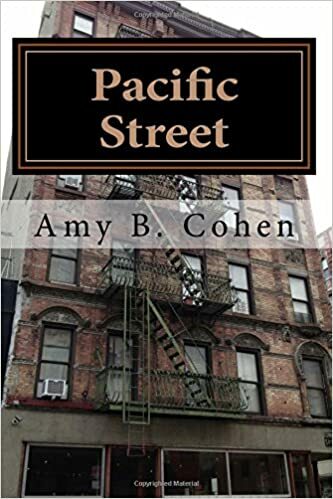 Amy – Thanks so much for the link. Thanks to you, I have now connected one of the few remaining “disconnected” Tuteurs in my family tree — it turned out that he was the son of one of the “connected” Tuteurs, and he is mentioned in his father’s obituary (in the Jewish Criterion). Nothing makes me happier than filling out the tree with people who SHOULD BE related but we don’t (until now) know in what way. I will be spending A LOT more time with the Pittsburgh collection. Thanks again! Michael, I am so glad that it has been so helpful to you. I also have found many good items there. Nothing better than an obituary to open all those new pathways! do you know more about the Adler family, Jon and Miriam carol? seems like her maiden name was Levine and may have been from Pittsburgh area also? They lived in Washington PA and were part pf the community there for a while. Their daughter Marjorie married a David Cohen, perhaps also originally from the area. Thanks. and if yes is there a way to see the book on Was. Pa online somewhere? Hi Eli, I am not familiar with that name. I searched my tree and my blog, and those names are not part of my family. I will email you so that you can get in touch with Marilyn. I do not have the book with me (I am out of town), and it is not available online. Thanks for reading and commenting!